THE place to come for massive fantasy adventures (if man-eating demons and giant robots don’t phase you.) Dare you enter a graphic world that’ll thrill you, scare you and blow your mind? If that’s a ‘yes’, follow Emily and Navin into the sinister underworld beneath their house. After their dad dies, Emily and Navin move to their mum’s late great-grandpa’s home. But it’s a spooky place – and the danger isn’t all in their minds. When a sinister monster lures Mum through a door in the basement, Em and Navin follow her into a dark underground world. It’s a place of demons, robots and talking animals – including cute little mech-rabbit Miskit. Can Emily and Navin defeat a hideous monster, unlock their secret destiny – and save the person they love most? 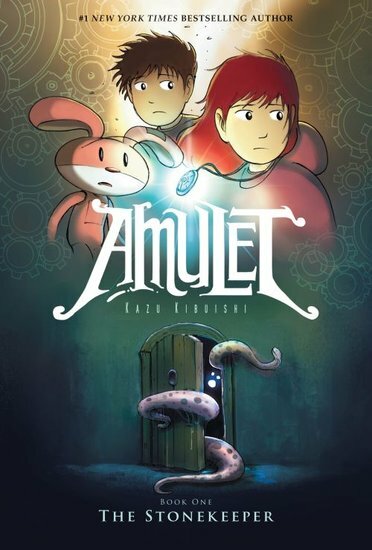 Kazu Kibuishi is the writer and artist of the bestselling AMULET graphic novel series. He is also the editor/art director/cover artist of the EXPLORER and FLIGHT Comic Anthologies, and is the cover illustrator of the Harry Potter 15th Anniversary Edition paperbacks in the USA. His debut graphic novel, Daisy Kutter: The Last Train, won a YALSA Best Books for Young Adults Award. Born in Tokyo, Japan, Kazu moved to the U.S. with his mother and brother when he was a child. He graduated from Film Studies at the University of California, Santa Barbara in 2000, and moved to Los Angeles to pursue a career in the entertainment industry. He currently works as a full-time graphic novelist. 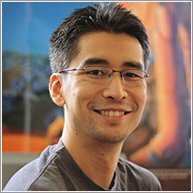 Kazu lives near Seattle, Washington with his wife and two children.